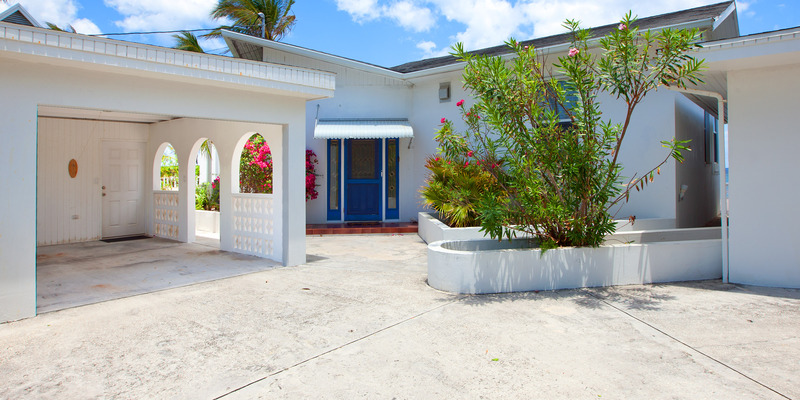 Moon Glow is a 2 bedroom oceanfront home in Rum Point along the north coast. 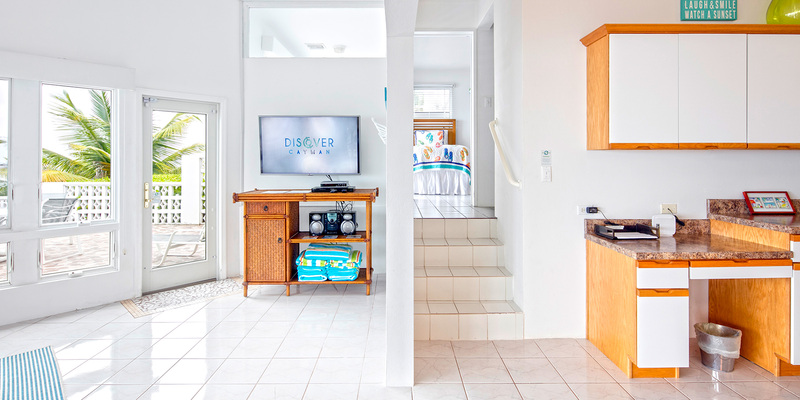 With cute, sunny interiors that capitalize on the ocean views, sandy beach, and oceanfront sun deck, Moon Glow is a great beach retreat for small families. Moon Glow sleeps 6 guests (4 adults max) across a master king suite, twin bedroom, and pull-out queen sofa in the living area ideal for 2 children under 12. The living room comes furnished with a comfy couch set, flat screen TV, and stereo. 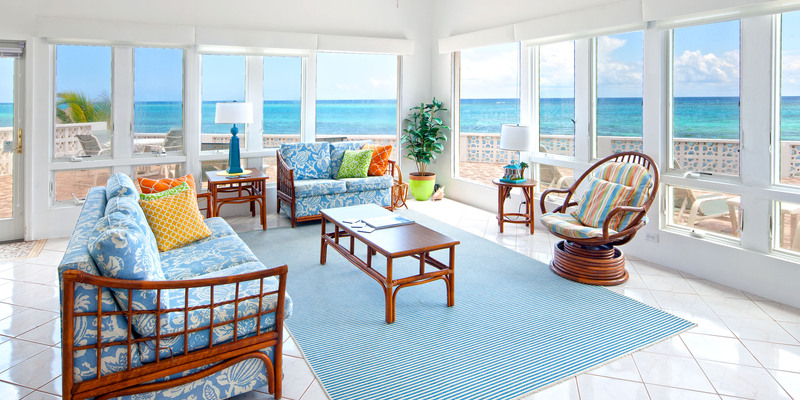 Both bedrooms feature floor-to-ceiling windows for breathtaking views of the beach and ocean. A modern kitchen comes equipped with standard appliances and stocked with dishware, utensils, cookware, and cutlery. Guests can dine indoors with seating for 6 just off the kitchen, or grill outdoors on the patio and enjoy al-fresco dining with seating for 4. The closer you get to Rum Point, usually the sandier the beach as well as swimming. Either way, with the abundant marine life we have in the water, you will want to wear foot protection (pool shoes or fins). 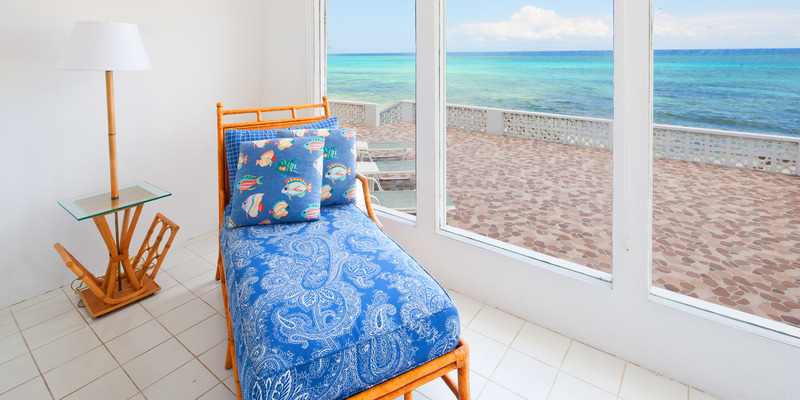 The prevailing breeze (trade winds) from the east also make flying insects less of a nuisance—many of the homes in Rum Point don’t even need a screened porch. Lastly, about 20 minutes east we have two large resorts (Morritt's The Reef) that offer manicured beaches plus restaurants, a grocery store, liquor store, gift shops, a Subway sandwich shop, and cafe/pastry shop. These two resorts also offer scuba, snorkel trips, jet skis, windsurfers, kiteboarding, ocean front pools and bar service. Tortuga Divers and White Sand Water Sports offer snorkeling tours, paddle boards, jet skis, etc. We loved Moon Glow! Perfect villa for our family of four. Best snorkeling on the island right off the house! This property was lovely. The views are fabulous, it was clean, and the area was so quiet! The snorkeling right in front of the house was great, the kayak was fun and it was nice to be such a short walk to Rum Point. We did need to contact the Property Manager for an issue with the safe and they responded promptly. Used Red Sail Sports out of Rum Point for a sail - they were fabulous, highly recommend!! 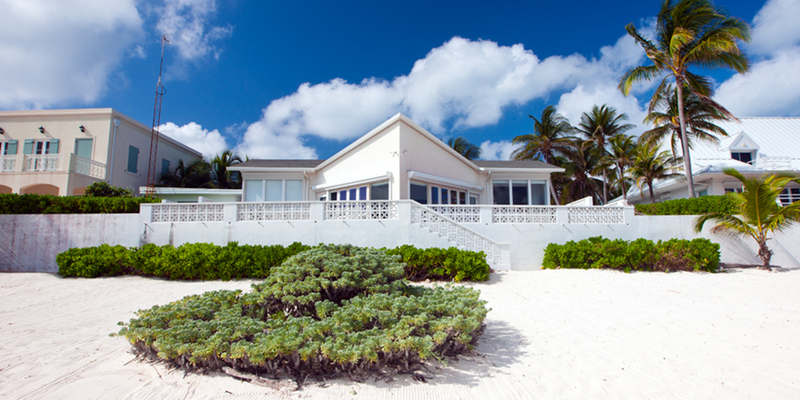 Great beach rental. 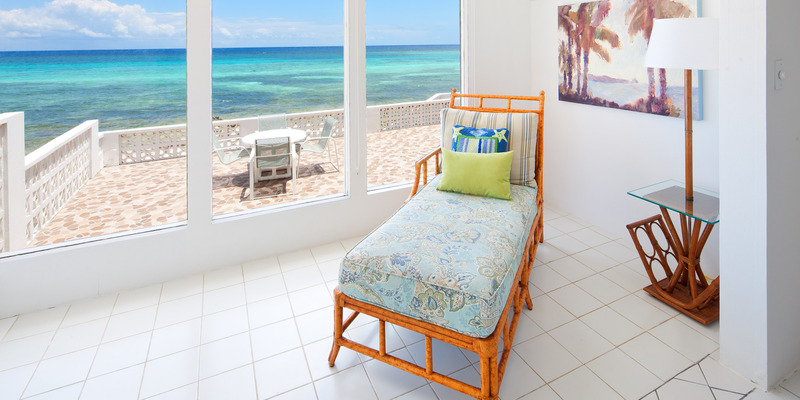 Beautifully furnished, stunning views and well equipped with all you need for a great stay. Special shout out to a great local caretaker team. Would stay again and recommend to family and friends. The house had the most beautiful view and the patio with patio furniture was awesome. The only regret was the seaweed that had been brought in with the storms right before our arrival. Everything we needed was provided. We enjoyed going to Rum Point to enjoy our favorite fish and chips and terrific drinks. We rented a car and explored most of the island. Our favorite thing to do was see the stingrays and starfish and found the most amazing places to snorkel. We definitely will be back in the future! Thank you for your kind review! We would love to have you back to Moon Glow!!!! We absolutely enjoyed our 4 night stay at Moon Glow. The property was well equipped and extremely clean. The kitchen, bedrooms and bathrooms were well stocked with supplies and needed amenities. 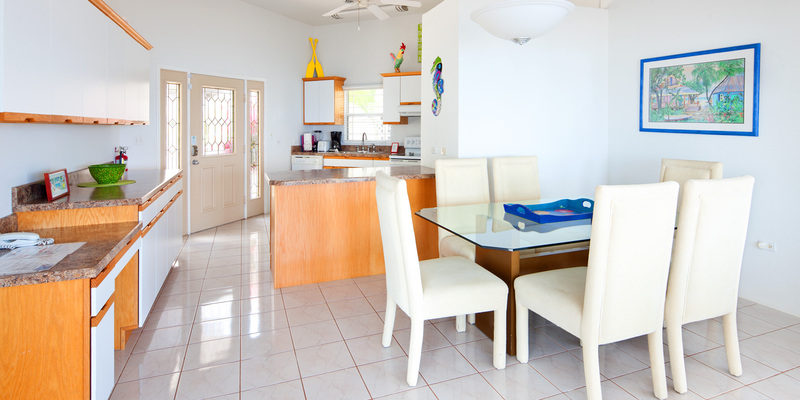 The entire home, indoor and outdoor, was sparkling clean and ready for enjoyment. The sundeck was amazing and the outdoor furniture was perfect to tan and lounge on. 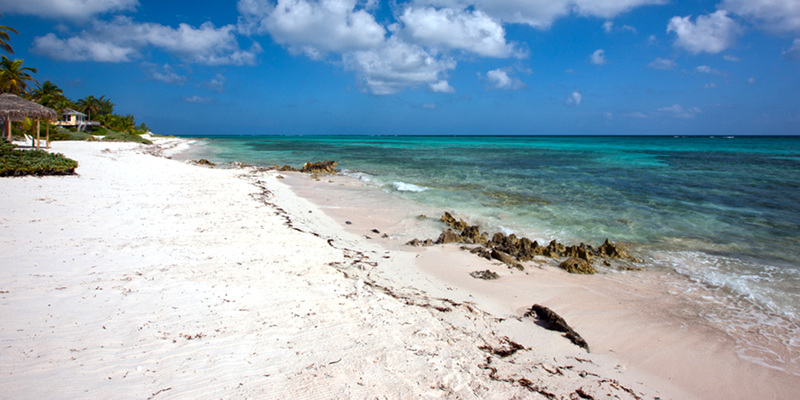 A super short walk to Rum Point Bar and Restaurant beach side or roadside. Stay on Sunday and there is a large boat gathering at Rum Point with lots of fun, food, drinks and music. 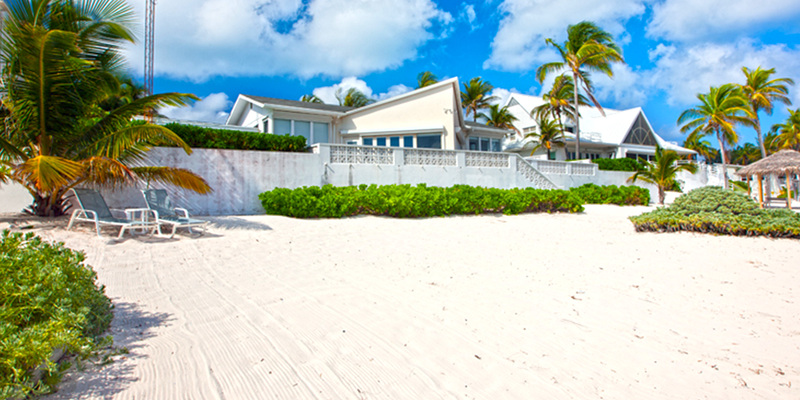 A MUST STAY IN THE CAYMANS! Great location and view if want quieter side of island. Our family loved it. The view from the deck, private beach, and access to great snorkeling was the best part. We wanted to be near Rum Point and Kaibo, our favorite spot on the island. Way more quiet than SMB, if that is what you want. After a few days, will run out of restaurants close by, but there are other interesting places to explore by driving. The kayak at the house was fun and easy to navigate. Did lots of snorkeling in the coral gardens in front of the house. Getting in water is a little rocky. The House was clean and adequate for what we wanted. A little dated, but worked just fine. For the minor maintenance issue we had, help was on its way promptly. We would stay here again. A very enjoyable stay. Comfy home, slept great, great people to deal with. Loved the Silver Thatch chartered boat trip.A totally enjoyable afternoon with George, the Captain. Moon Glow was perfect for our Cayman Islands getaway. Great deck overlooking the ocean. Deck furniture was very nice. Clean and well appointed home. Loved the carport. Great to leave the Jeep in with the top down all the time. Stingray City is a must do. My family and I thoroughly enjoyed our stay at Moon Glow. The house is EXACTLY as shown in the pictures. It was perfectly clean and everything we needed. 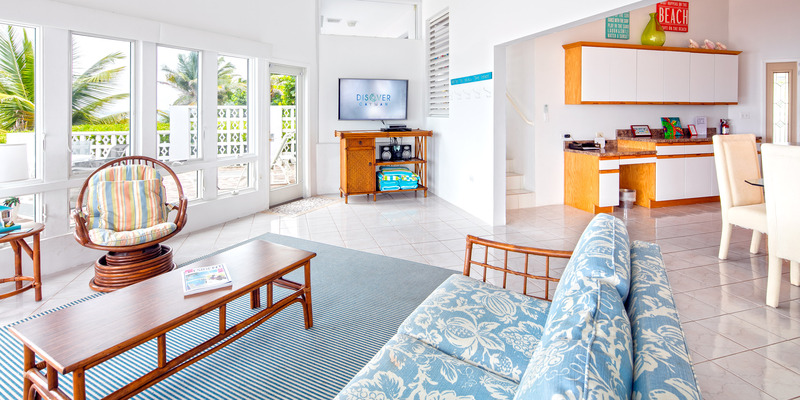 The patio area is the best feature of the house and a great place to watch the sun rise, look out at the ocean, sun tan, or drink coconut rum and pineapple juice. The washer and dryer, WiFi, and kayak are wonderful features. Moon Glow is walking distance to Rum Point Beach. I highly recommend staying at Rum Point rather than dealing with the cruise ship and tourist mobs at 7-mile Beach. My husband and I just returned from spending 6 days at Moon Glow. If you are looking for a private, quiet vacation away from it all, this is the place. The house is very clean and very simply decorated. Nothing fancy but provided everything we needed. The views were breathtaking especially the sunrises. There were strong winds while we were there so the beaches were covered in seaweed but also with shells. Moon Glow is only a 1 minute drive (short walk) to Rum Point, if you want some activity. We ate at the beach grill and restaurant while there. We also went on a sunset sail out of Rum Point which was very nice. Starfish Point was also a fun time and only 5 minutes away. Make sure you stop for groceries and liquor on your way from airport. I\'ve never experienced such peacefulness on a vacation. Grand Cayman has become my favorite Caribbean location and the Northside is my kind of place (a little Bob Marley music here). Moon Glow was exactly what we were looking for and I have to say it one more time - the views are breathtaking. Five stars for: beautiful beach and ocean views from all rooms, quiet location with easy walking access to Rum Point and Kaibo, excellent snorkeling right off the beach, kayak included, well equipped kitchen, king sized bed in master, sufficient wifi for adult family of 4, barbecue grill, friendly and helpful staff from booking to on island, our children (21 and 18) were never bored and we would return again. The furniture is showing some wear and the bathrooms could be upgraded, but we were outside all day every day so it didn\'t matter to us at all. No pool, but again, no problem because we were in the ocean all day. Stingray city tours close at rum point and kaibo, several restaurants within 10-20 min drive. The VIEWS!!!! 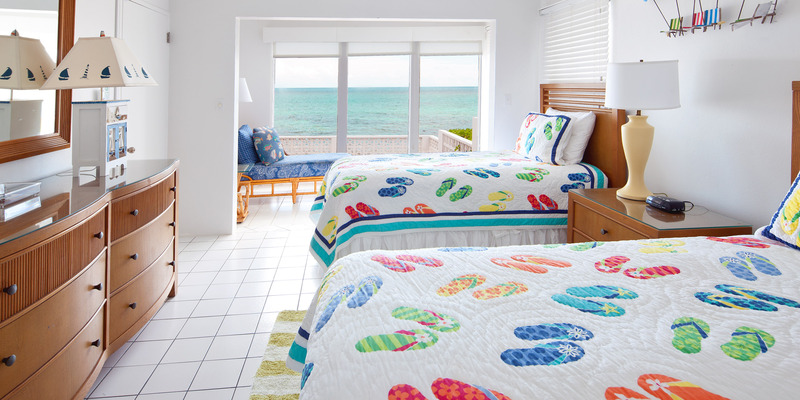 Lots of windows, the location is perfect, the beds were comfortable, the place was immaculate, the snorkeling, the air conditioning, the washer and dryer, parking, and everything we needed. Everything was perfect! 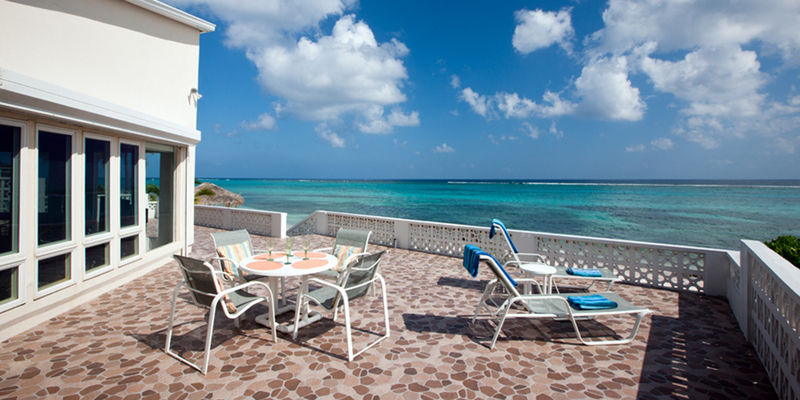 Grand Cayman villas was extremely responsive and helpful with all our questions and needs. When we first arrived, we walked in and our jaws dropped. You instantly see the ocean views that are just breath taking. The villa was extremely clean and had a nice fresh smell as we walked into the kitchen. Everything you need is there for you. The beds were very comfortable, a big plus for us. The patio is equipped with a grill for cooking. You want to make sure you stop by the grocery store before driving to Rum Point. Food is very expensive there due to the US currency exchange. We also had the pleasure of meeting the store owner at Christholms market which was a 4 mile drive from the villa. He was great. If you need any pick up foods during your stay, shop there. If you choose to eat out instead of cooking, there are many good places to eat. We had Sunday brunch at \"The Lighthouse\" and one night ordered a pizza from there. The food was great! We did find out that no one will deliver food on that end of town. 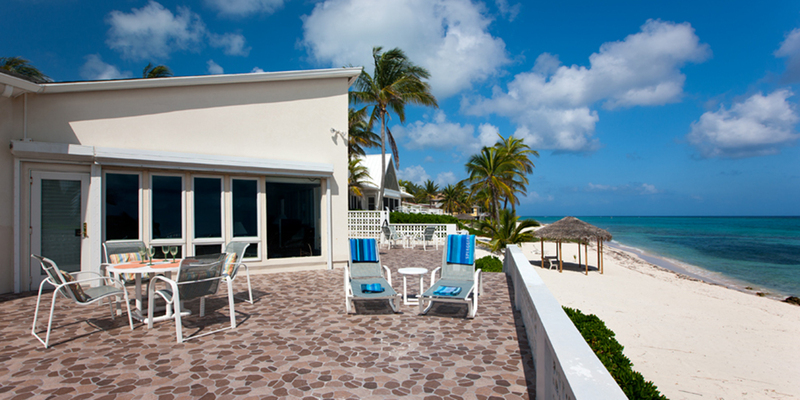 The Rum Point resort is just a walk down the road. We found it to be less crowded than the 7 mile beach. The island is just beautiful, and I can\'t express enough how great all of the staff members from Grand Cayman Villas and condos were. Very accommodating. Thanks Sherman and Ray for all you good advice, help and service. Thanks Jim for getting all of our stay paperwork in order before arrival. We so appreciated it. This company has many beautiful rentals. Rent one, you won\'t regret it! Great location and fabulous ocean views! We thoroughly enjoyed our stay. 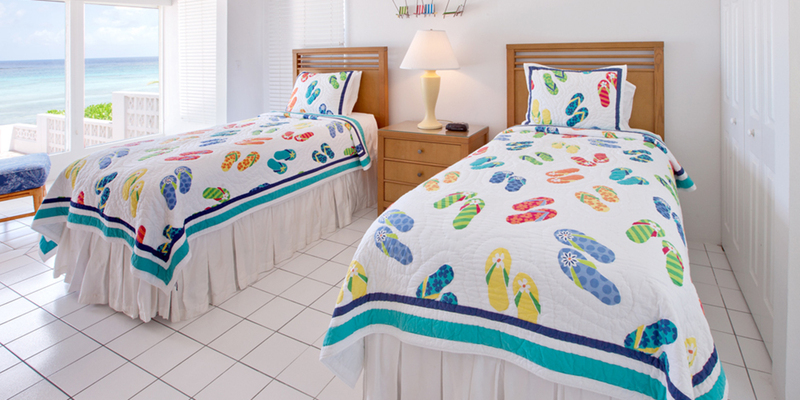 Moon Glow is within walking and/or snorkeling distance to Rum Point and is a very comfortable home. Snorkeling is the best way to get to Rum Point, we saw sting rays, squid, and many colorful fish, to include lion fish but the real treat was following the baby sea turtle. Not too close, just watching the turtle glide through the water was mesmerizing. Sitting on the deck and listening to the sounds of the ocean was a great way to spend our evening. We hired, Rosie Parris, (a local cook) to prepare dinner one evening and she did an amazing job; using fresh local fish, fruits and vegetables. The Rum Point Club and the Kaibo Beach Bar and Grill are both good for lunch or dinner and within 2 miles of Moon Glow. If you dive, Ocean Frontiers is on the East End and they do a great job. We also used Deep Blue Divers over in George Town for calmer water and for our less experienced divers. We used Deep Blue when we went to the Kittiwake, they were incredibly knowledgable and we enjoyed diving the wreck; saw a spotted eagle ray gliding through the water. If you have a party of 5-6, check out absolute Divers; they do private charters at a reasonable price and we enjoyed diving 2 trips with them and they picked us up right at Kaibo. Bombay Chopsticks is a fabulous restaurant in the East End, you will need a reservation. We had a fabulous vacation and would return to Moon Glow again for a party of 4. Btw, if you have a larger party, check out Kai Vista, we stayed there a few years ago and it is a great property about 5 houses from Moon Glow. Has a private pool, hot tub and same fabulous views! My husband and I have been to Grand Cayman many times. We love it. Our favorite part of the island is Rum Point. 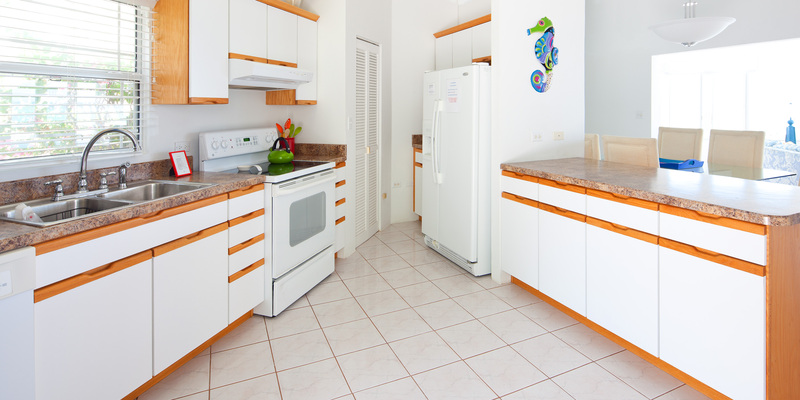 We have stayed in condos, as well as other private home rentals. While Moon Glow might not have been as "up to date" as some of the other places we have stayed, we throughly enjoyed our trip. You can't beat the location. We could walk to Rum point, my husband even snorkled there from the house! We went with another couple and had plenty of room in the house. Like I said, the house was good just a bit out of date, for instance the laundry facility was outside in the detatched carport. Also no electrical outlets in the bathrooms. 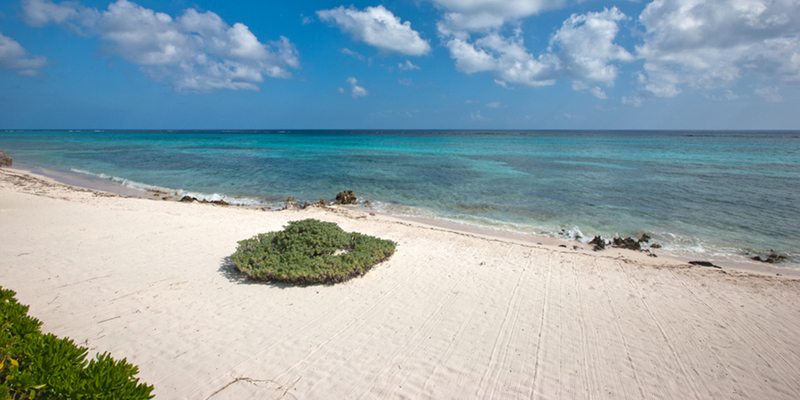 All in all we still really enjoyed our trip, but then again who doesn't love Grand Cayman! !